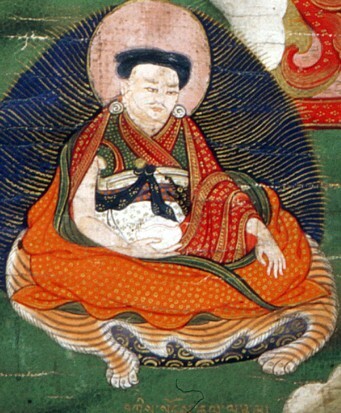 Changdak Tashi Tobgyal (Wyl. bkra shis stobs rgyal) (1550?-1603) — an important master in the Northern Treasures lineage, he was a student of Rigdzin Lekden Dorje and the father (and teacher) of Rigdzin Ngakgi Wangpo. He is counted among the previous incarnations of Jikmé Lingpa. The biography of Padmasambhava entitled Ocean of Perfect Wonder was earlier thought to have been composed by Tashi Tobgyel. However, as pointed out by Franz-Karl Ehrhard, the colophon of the work reveals that the biography was composed by Jamyang Sonam Wangpo (Wyl. 'jam dbyangs bsod nams dbang po, 1559-1620) and his father Nakchang Kunga Rinchen (Wly. sngags 'chang kun dga' rin chen, 1517-1584). Ehrhard, Franz-Karl. "An Ocean of Marvelous Perfections": A 17th-Century Padma bka'i thang yig from Sa skya pa School. In: Tibetan Literary Genres, Texts, and Text Types, edited by Jim Rheingans, 139-181. Leiden: Brill, 2015. This page was last edited on 9 January 2018, at 23:17.